Discounts are available for 5'-3' reverse dC! 1. Formation of oligos containing hairpin loops with parallel strands. Oligos with hairpin loops are used for structural studies into duplex formation. Typically the strands of the stem of the hairpin are anti-parallel. However, by switching to 5'-phosphoramidites for part of the synthesis of such an oligo (for example, initiating the switch during synthesis of the loop portion of the hairpin), the strands of the hairpin stem will be in parallel orientation (1). 2. Formation of nuclease resistant (5'-5', 3'-3') linkages. 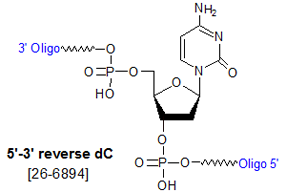 Anti-sense oligos containing terminal 5'-5' or 3'-3' linkages are highly resistant to exonuclease degradation. For the terminal 5'-5' linkage, the appropriate 5'-phosphoramidite is incorporated at the 5'-end in the final synthesis cycle. For the terminal 3'-3' linkage, the appropriate deoxynucleoside-5'-CPG is used as the solid support for the 3'-end, followed by synthesis of the oligo in the standard 3'-5' direction to make the terminal 3'-3' linkage (2). 3. 3'-terminal base/moiety cannot be attached to a CPG. Examples include 2',3'-ddT or ddI. 1.	van de Sande, J.H., Ramsing, N.B., Germann, M.W., Flhorstn, W., Kalisch, B.W., Clegg, R.C., Pon, R.T., Jovin, T.M. Parallel-Stranded DNA. Science (1988), 241: 551-557. 2. Ortigao, J.F.R., Rosch, H., Selter, H., Frohlich, A., Lorenz, A., Montenarh, M., Seliger, H. Antisense effect of oligodeoxynucleotides with inverted terminal internucleotidic linkages: a minimal modification protecting against nucleolytic degradation.Antisense Res. Dev. (1992), 2: 129-146.